In a village-like setting, surrounded by lush tropical gardens, the Two-bedroom Villa offers the height of luxury holiday accommodation. This villa houses two spacious bedrooms, two en-suite bathrooms and a large indoor and outdoor living area including a private pool. Guests will enjoy the sheer luxury of this villa with a private valet at their every beck and call. Fresh greens mix with dark browns and the sleek light wooden furniture to create a sophisticated yet relaxed decor. The American-style kitchen opens onto the large living area featuring plush furniture and equipped with a high-tech media hub including WIFI access. Smooth wooden decking surrounds the intimate dining area and the free-form infinity-edge pool. Further down the garden guests will enjoy the specially-built barbecue area and make the most of true island living. This modern holiday home is ideal for families looking to spend quality time together as well as benefit from some well-deserved alone time. The elegant master bedroom extends onto a sumptuous en-suite bathroom. 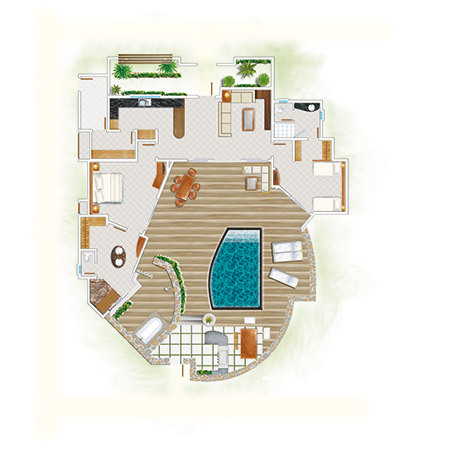 In the shade of a private gazebo, parents will enjoy the outdoor shower and deep-soak tub. The second room is tailored for the younger members of the family. A contemporary nautical theme enlivens this part of the villa. Children will also have with their own bathroom, equipped with all they may need no matter their age. This villa ensures that guests benefit from the best of privacy, space and luxury. Fully equipped kitchen including oven, stove, microwave, toaster, Nespresso coffee machine, wine fridge, etc.